I’m still massively enjoying the new Drukhari codex at the minute, and have been excitedly planning out the list that I want to really concentrate on for the next while. After giving it some thought, I’ve decided to go in something of a different direction to my usual builds, thinking it might be good to break out of the established pattern and go for something new. So I thought I’d write up some of my thoughts for you all, along with presenting the list itself! Grab a cuppa, and let’s take a look! So it’s a 2000-point list that is staying away from the Raiding Force idea of multiple patrol detachments, primarily because, after having given it some thought, I’ve decided against falling into that trap of The New and The Shiny. Sure, it’s nice that we get a really unique and flavourful rule like this, but I think it has an allure that is distracting from the main focus of what this army needs. I don’t believe we need to go for a whole mass of Command Points, as the army is going to work quite well with the basic stuff you get from a couple of Battalions. The list above will still net me ten CPs, only one off the list I presented at the weekend that was trying to go for all of that Raiding Force stuff. 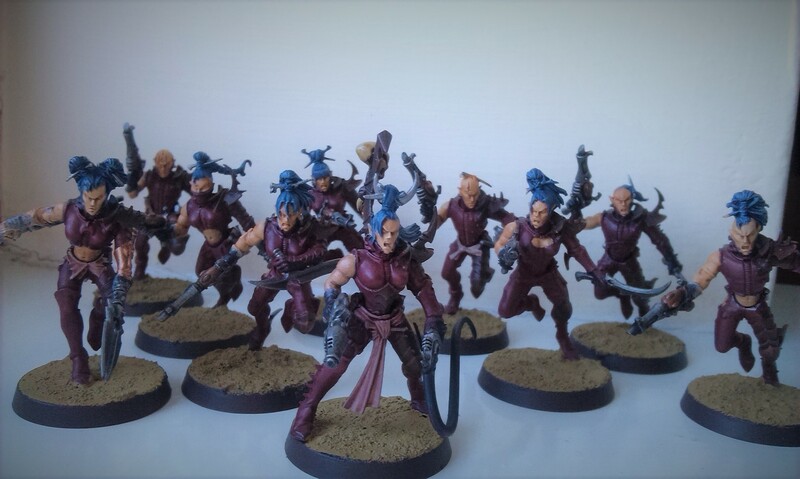 I do believe that we need to stick to a much more focused build when assembling a Drukhari army. The Kabalite part of this that makes up the first Battalion is almost unchanged from the weekend’s list, merely juggling the Warriors about a little in order to make better use of having the Raiders now equipped with Splinter Racks. I don’t throw an awful lot of 6s, but I think the sheer weight of fire that the Raiders will be throwing out should allow for at least a couple of exploding dice here… I’m otherwise keeping things as they were, with the Court and Archons in a Venom, all three squads of Kabalites in Raiders, and a Ravager in the back to punch out some (hopefully!) decent firepower. Where things get different, however, is that I’ve foregone the Coven builds of my usual lists in favour of Wych Cult stuff! I’ve said it before, I’ve not played a lot of Cult stuff to know what I’m doing or, well, anything, really, so this is going to be quite the learning curve. Let’s get down to some particulars. I’m still taking Kabal of the Obsidian Rose, allowing me to gain those 6 extra inches on my weapons, which will hopefully allow me to keep things at bay while I move my Cult models into position, maybe allowing for some extra time to properly threat-assess the situation. For my Cult, I’m going with Cult of the Cursed Blade, which gives me +1 strength and ensures I only lose one model to failed morale tests. Cursed Blade also have the nice Concealed Booby Traps stratagem that dishes out mortal wounds to charging enemies. It’s a little situational, as it requires the Cursed Blade unit to be in terrain, but it’s so thematic that I just love it! They also have the relic that allows your Succubus to blow up, which is another wonderfully thematic idea! Now, I’m actually thinking of not using the Alliance of Agony stratagem to dish out an additional Warlord Trait to a Succubus, as much as I do enjoy the Treacherous Deceiver trait. 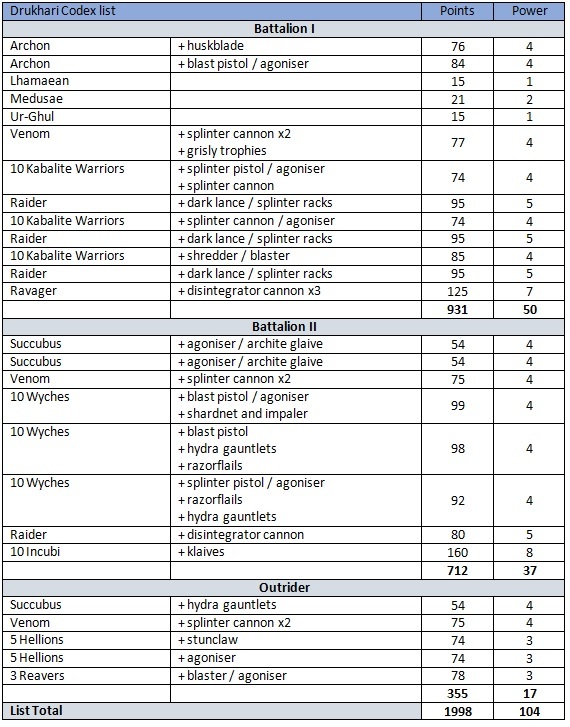 There are a lot of flying Wych Cult units in this list, and so I can see myself wanting to use Eviscerating Fly-by as often as possible; it only costs one CP, but I also think Hyperstimm Backlash is going to be another popular one for me, and so having these Wych Cult units in my force is opening up more doors! I’m excited to use Hellions in a big way, as I’ve only used them once previously, and I don’t think I really did well with them. In particular, I think the hit and run ability should be something that is pretty much abused for all its worth, falling back to allow the unit tangled up with them to be shot at, then charging back into any survivors. I’ve had some success with Reavers in the past, although again, I think I’m not using them particularly well. For the moment, I’m not bothering with either cluster caltrops or a grav talon, although I have lots of the jetbikes modeled with both. I think I might be tweaking this list for some time once I get playing it, so there’s always more opportunity to add in specific bits. Each of those only costs 3 points, as well, so it’s not going to be exceptionally difficult to fiddle. I’m most excited to be including Incubi, however! Now, it’s true, these aren’t the official Incubi models, but rather Wildwood Rangers that I’ve barely done any work to make them into Incubi. I’ve still got five more to build, though, so I’m thinking I might do a bit more to incorporate them into the Drukhari feel. At 160 points for ten, they are quite expensive, but then they’re a big blob of elite warriors, so it’s probably to be expected. 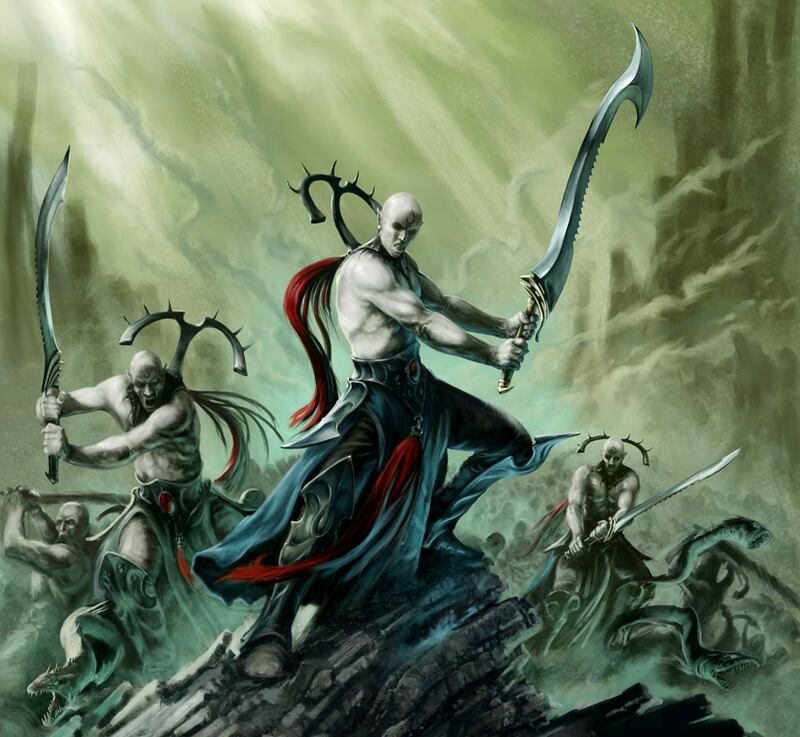 I’m incorporating them into the Wych Cult side of the army simply because they too are melee-orientated, but as Blades for Hire, it doesn’t really matter where they go, I suppose. As an aside, I’m also weighing up the option of swapping out the Incubi for Mandrakes – I’ve been giving it some vague thought, and I’m currently planning to convert up some Namarti Thralls once they’re released in a little under two weeks’ time, having not been entirely satisfied with my use of Sylvaneth Tree-Revenants. I think these blind chaps might prove to be very atmospheric, and I’m sure I can paint them to blend in to the rest of my force quite nicely! And both Mandrakes and Incubi weigh in at the same points cost for ten, so it’s easy to swap them around as required! So there you have it, my current plans for my Dark Eldar / Drukhari army post-Codex. While I have the Kabalite side painted up and ready as it stands, I think I’m still quite a way off having the Wych Cult side ready. I know for sure I still have some “Incubi” to build, and likely some Wyches, too. At least I have a bit of a focus now, however, so I’m hoping that will help me to get moving with painting up some units ready to have some games! Next week, I’ll be moving back to the Tau, and updating you all with my progress there – stay tuned!